New York Gov. Andrew Cuomo: Like father, like son. Just as his father seized a social issue and established himself in opposition to the church with his Notre Dame speech on abortion, now the son has seized a social issue and established himself in opposition to the church with gay marriage. Video: “Mystical” city appears in clouds over China, then vanishes. The “right” to abortion remains constitutionally shaky. “What is unusual about Roe is that the liberty involved is accorded … a protection more stringent, I think it is fair to say, than that the present Court accords the freedom of the press explicitly guaranteed by the First Amendment. What is frightening about Roe is that this super-protected right is not inferable from the language of the Constitution, the framers’ thinking respecting the specific problem in issue, any general value derivable from the provisions they included, or the nation’s governmental structure. Nor is it explainable in terms of the unusual political impotence of the group judicially protected vis-a-vis the interests that legislatively prevailed over it. And that, I believe … is a charge that can responsibly be leveled at no other decision of the past twenty years. Guéranger’s principles of the Anti-Liturgical Heresy is presented here as means and method to recognize the subversive tactics employed by the 20th Century Liturgical Movement, a heretical movement that has succeeded in deforming the Church’s liturgy and obscuring the right teachings of the Catholic Church among mainstream Catholics. The ensuing crisis has been devastating, but authentic Catholicism survives and even flourishes in traditional Catholic enclaves where the Traditional Latin Mass and its commensurate spirituality are lived and cherished. However, traditional Catholics must always remain vigilant in their fight against the Anti-Liturgical Heresy that is eating away like a cancer at the visible institutions of Christ’s Church. As it turns out, Pope Benedict XVI, in the motu propio, Summorum Pontificum, declared, in agreement with the traditionalists, that the liturgical books of 1962 had never been abrogated when the novus ordo was promulgated! What’s more, traditional Catholics had a right to the old Mass! However, to my knowledge Vere and Madrid didn’t even bother to correct their book, which still contains these errors along with a few other doozies. Nor were apologies forthcoming when the excommunications of the bishops of the Priestly Fraternity of St. Pius X were lifted by the Holy Father. Now that prominent churchmen and theologians are taking seriously the traditionalist critique of the 20th century changes in the Church, as first formulated by thinkers such as Romano Amerio, it is becoming crystal clear that a place is being carved out for traditional Catholics in an emerging Church, just now starting on a reform in continuity with Tradition of the post-Vatican II errors. That place had been denied to traditional Catholics, not just by the liberals of the “hermeneutic of rupture”, but also by the mainstream, novus ordo conservatives such as Vere, Madrid, and, our friend, Mr. Mark Shea. So the present situation that these novus ordo conservatives find themselves in after Summorum Pontificum is a rather uncomfortable one. They were so sure that the old liturgical books had been abrogated. Wrong! They were so sure that the novus ordo was the Traditional Latin Mass for the very reason that the old books had been abrogated. Wrong again! Because the old liturgical books were not abrogated, and because there are now two forms of the Roman Rite, the novus ordo is certainly distinct from the Traditional Latin Mass. They were so sure that there was no room in the Church for those disaffected traditionalists that were attached to the Traditional Latin Mass. Wrong again! We are to be welcomed and all generosity is to be shown to those who are attached to the Traditional Latin Mass. They were so sure that all those criticisms of Vatican II and the 20th Century changes were disobedience. Wrong again! The debate has been welcomed, and, according to the secretary of the Pontifical Commission Ecclesia Dei, the criticisms “make sense”! The Rev. John Corapi, who served as the director of Catholic Faith Formation in Sacramento in the 1990s, filed a lawsuit in the 11th Judicial District Court of Montana, where he now lives. He alleges that his accuser committed libel and that a letter she wrote to his religious superiors contained “numerous false, malicious and unprivileged statements” about the priest. He is suing for punitive and unspecified compensatory damages. Survivors Network of those Abused by Priests on Wednesday publicized Corapi’s lawsuit, which was filed in April. “I think it is reprehensible that he would sue her,” said David Clohessy, national director of the victims rights group. “Clearly, he is trying to intimidate her.” He said a priest suing his accuser is unusual. This Week’s Ask Alice: Jehovah’s Witnesses and the Nature of the Human Soul. Email responses will also be provided, as time permits. Tom Asks: Is there anywhere in the Bible that state’s specifically that the soul is immortal and will never die? I have Jehovah Witnesses come to the house. They say the soul dies with the body. i would like to rebut that claim with my own Catholic Bible. Alice Answers: Yes, Jehovah’s Witnesses are very persistent in their rhetoric. However, we Catholics maintain a firm belief in our souls’ immortality based on numerous Scripture passages, many spoken by Our Lord himself. Rather than feeling defeated, I’m glad you’re seeking some strong Catholic apologetics, i.e., a defense and proof of our Catholic faith. Please keep these Bible verses handy, so you’ll be prepared the next time a zealous Jehovah’s Witness rings your doorbell! 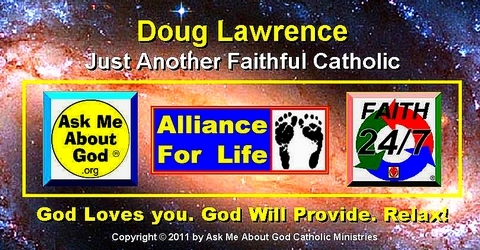 Doug Lawrence Adds: The Catholic Church’s teachings about the nature of the human soul are based on the Old Testament and on the teachings of Jesus and the apostles. They were further developed and refined by some of the world’s greatest saints, philosophers and scholars, over the last 2000 years. Like the word “Trinity”, which is not found anywhere in scripture, much of what we understand about the soul, by faith and reason, never made it into the scriptures, either. This shouldn’t be surprising though, since the Bible was never intended to be a catechism, and it is the Catholic Church … not the Bible … which was given power and authority by Jesus Christ. In fact, in his Great Commission, Jesus never specifically mentioned the written word, at all. JW’s have no direct connection with the Christian Church, other than their rather unique, seriously flawed, self-serving “New World” translation of the Bible. Rather than attempting to trade Bible verses with people who believe that Jesus Christ is not the only begotten Son of God … is not divine … but merely Michael the Archangel … I suggest you ask the JW’s to first show you where in the scriptures their little group received ANY power and authority … any mandate from God … to do what they do. If they manage to cobble together something, then ask them why their founder(s) and the secretive “Boys from Brooklyn” have been so wrong on so many of their predictions and claims, for so long … and based on that … why you should believe anything they say … since their teachings are relatively new, based on the opinions of only a few, whose fatally flawed understanding of the true nature and identity of Jesus Christ completely separates them from authentic Christianity … and whose teachings have been proved wrong, time and time again … by other JW’s … by history … and by the vast consensus of authentic Christian theological scholarship. Finally Tom, there is absolutely no need for you to refute negative, spurious, unsupported claims by these people, or anyone. I suggest that instead, when next they visit, you jointly attempt to determine precisely how many angels might be able to dance on the head of a pin! This link to the Catholic Answers Forum should be useful. This link on the unique, God given authority of the Catholic Church should also help clarify things.